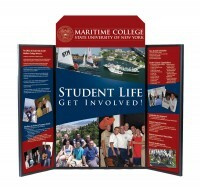 Self-Packing briefcase displays are a special group of table top displays. They are designed to fold down into an easy to carry briefcase size when not in use, although some larger models that are too big to carry easily come with wheels instead. 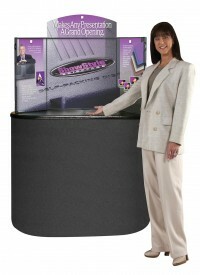 The face of each panel of the display is covered with a velcro receptive fabric to make it easy to attach or replace graphics. The graphics can stay attached when the display is folded up for transport, making set up and take down extremely quick and easy. 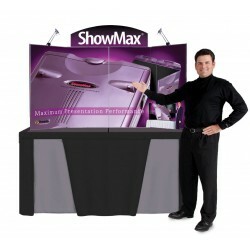 This makes them especially popular for presentations as well as trade show displays. There are several models available in this category, and some of the models come in multiple sizes to accommodate the needs of as many people as possible. Some of the displays include a removable header panel, and for others it's optional. Lights are included with some displays, and are optional on others, but not every model works with lights, so look at the details of each display to make sure it has the features you need. 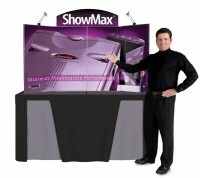 Contact us for help in chosing a display or with any questions.